Introducing some very special Prayer Mats I chose to name after wonderful empowering women & men in my life. These Prayer Mats are Handmade by poor vulnerable women in Kashmir being taught a skill empowering them to earn a living. Each Prayer Mat takes over 3 weeks for a team of sisters to hand embroider using silk threads. No two Prayer mats are the same they’re all unique 1 off pieces using amazingly colourful shiny silk threads. You have to see and feel the quality and weight to truly appreciate the workmanship that has gone into each one. Each Prayer Mat is made be a group of women who work as a #team to hand embroider these prayer mats using silk threads – and each one takes weeks to produce so it’s a true labour of love, they come to a vocational training centre run by Mother HelpAge. Please help me spread the love and help our sisters in Kashmir who are less fortune than us. 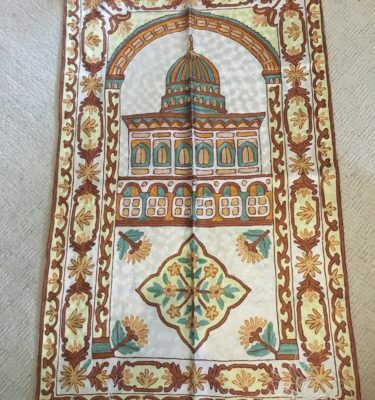 Only by knowing the story behind these products will you truly appreciate the value of owning something as special as these Prayer Mats. No pictures can do them any justice. Part of the proceeds from the sale of these Prayer Mats go to these women and towards running the training centre & material costs.